Little, Brown Books for Young Readers, 9780316557528, 176pp. 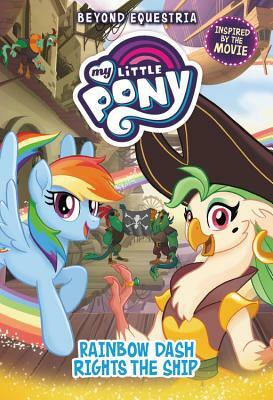 When Rainbow Dash invites Captain Celaeno and her crew to visit her hometown of Cloudsdale, the pirates gladly accept. They have a blast visiting Rainbow Dash, but a trip to a boring old museum isn't exactly their idea of a good time. That is, until they come to a glass case with a replica of an ancient Pegasus relic that supposedly created unending good fortune for all those near it. Now Celaeno is intrigued! Where is the real relic? Nopony knows for sure, but legend has it that somewhere in Equestria there is a map that leads the way. Calling upon her old friend Daring Do, Rainbow Dash leads the pirates on a treasure hunt like no other.